I bought a 2013 Nissan NV2500 V8 with 60,000 miles on it several months ago and after a few weeks I went to check the codes and got a P0303 which indicated a misfire on cylinder 3. 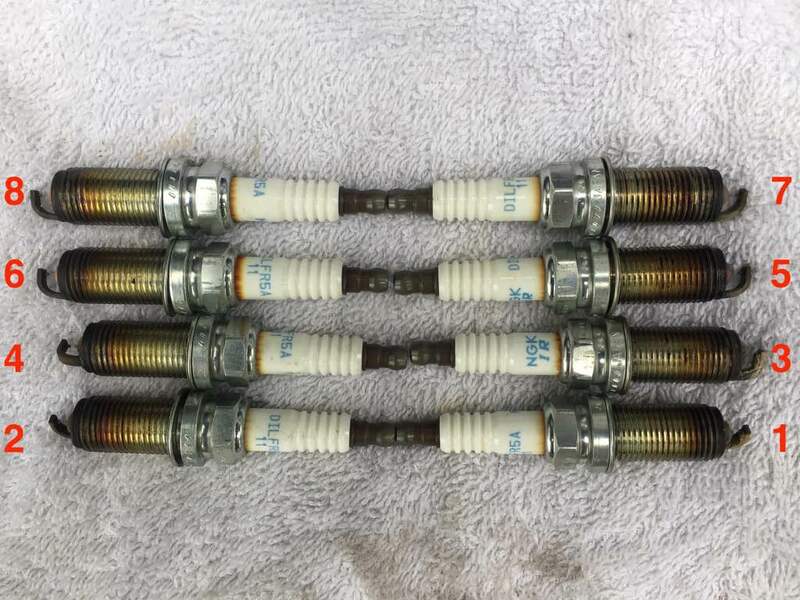 I was advised to use seafoam in the gas tank to try and resolve the issue and I did that but I also decided to change the spark plugs to see if that would fix the issue, I changed them all and a few of them had ash deposits (http://thezenvan.com...es/IMG_0061.jpg). A little while after doing that I started to get white smoke on startup, at first I thought it was just a side effect of the seafoam but it kept doing so for a few weeks so I decided to do a block test to make sure the head gasket wasn't the cause and the test showed it wasn't. I also changed the PCV valves to make sure they aren't the cause. I also did a wet/dry compression test which came out fine (https://i.imgur.com/OhZ4RXc.jpg), there were differences between the wet and dry results but they seemed to above minimum. There is oil being burnt because and I periodically need to add some. Cylinder 3 plug looks terrible! I can see why it was misfiring. 1 doesnt look that great either from what I can see. If you are positive the smoke is not coolant (coolant isnt dropping and it is not sweet smelling) and not puffy like normal water vapor burning off, then it has to be oil. That would normally mean one of two things (or both). Plus you mention it is burning oil. For both you will only see it on startup, once the engine is hot enough the oil will still be leaking but be burning off faster and cleaner so you wont notice the smoke until things cool down. Since you seem to know what you are doing, do a leak down test and that will help answer if it is the seals. Compression tests can be too quick for an accurate look at the seals, you need to know if they are still holding well. Thanks for responding, I did end up replacing plugs 1 and 3 after the compression test because they had ash deposits while the other plugs were clean. The white smoke certainly is more indicative of oil burn than water and it is a large white cloud and periodically happens about a minute or two after the initial startup as well but then stops when the engine warms up. I've also had a small cloud happen after pressing on the gas after idleing at a traffic light. The leakdown test was the next thing on my list I was just looking to see if there was something else I might've missed that would help me avoid taking apart the engine. White smoke is coolant. Blue is oil. I would look that direction. The mechanic I took it to said the same thing. He said it is most likely because of worn out rings caused by improper maintenance of the vehicle. Specifically, what type of maintenance was missed? I don’t have the manual in front of me, but coolant maintenance is important. If you change the coolant before the recommended mileage, you have to replace it on a different schedule.